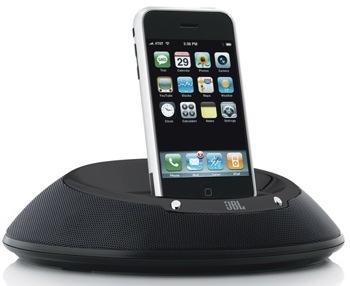 CES: JBL introduced the JBL On Stage IIIP high-performance loudspeaker docking station for use with the new iPhone. control; it also includes a mini stereo jack for use with non-iPhone/-iPod devices. And with the option of AC power or battery operation, the JBL On Stage IIIP docking station can be used at home or on the go. Incorporating the Apple iPod Universal Dock adapter, the JBL On Stage IIIP system is compatible with all docking iPod models and the iPhone. And the JBL On Stage IIIP system’s OnePoint design lets the user charge a docked iPod or iPhone, and enables connectivity with a USB 2.0 cable for synchronizing an iPod or iPhone with a Mac or PC. The JBL On Stage IIIP system has a suggested retail price of $169.95, it will be available in February 2008 online at www.jbl.com and at quality retailers nationwide.